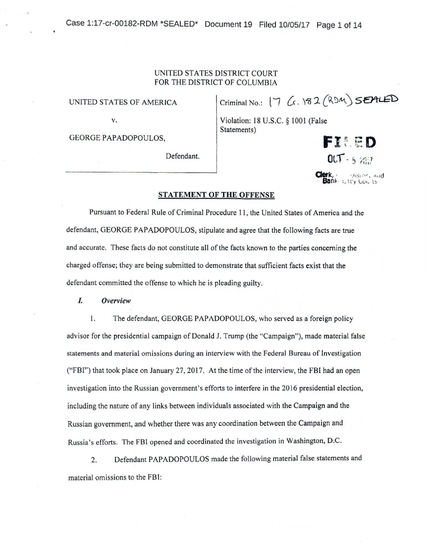 Mr. Papadopoulos was quietly arrested at Washington Dulles Airport on July 27 and has since been cooperating with the special counsel, Robert S. Mueller III, records show. Mr. Papadopoulos’s conversation in April raises more questions about a subsequent meeting in June at Trump Tower, where Mr. Trump’s eldest son and senior advisers met with Russians who were similarly promising damaging information on Mrs. Clinton. The documents released on Monday said that several senior campaign officials knew about some of Mr. Papadopoulos’s interactions with the Russians. The documents do not say whether he mentioned the Clinton emails to anyone. The professor, who was not identified in court documents, introduced Mr. Papadopoulos to others, including someone in the Russian Ministry of Foreign Affairs and a woman who he believed was a relative of the Russian president, Vladimir V. Putin. Mr. Papadopoulos repeatedly tried to arrange a meeting between the Trump campaign and Russian government officials, court records show. “We are all very excited by the possibility of a good relationship with Mr. Trump,” the woman, who was not identified, told Mr. Papadopoulos in an email. She was not actually a relative of Mr. Putin, according to court documents. Mr. Papadopoulos told the F.B.I. in January that the professor was “a nothing.” But Mr. Papadopoulos now acknowledges that he knew the professor had “substantial connections to Russian government officials.” Attempts to reach Mr. Papadopoulos on Monday were not successful. Mr. Papadopoulos was one of a small group of foreign policy advisers that Mr. Trump announced in March 2016. Another of the advisers, Carter Page, has met with the F.B.I. about his own meetings with Russians. The plea was unsealed on the same day that Paul Manafort, the former Trump campaign chairman, and his longtime associate, Rick Gates, were indicted on charges of money laundering and conspiracy. Mr. Papadopoulos was first interviewed by the F.B.I. in January, as the bureau was investigating connections between the Trump campaign and Russia. In that interview, Mr. Papadopoulos said that he began communicating with the professor and the Russian woman before he became a foreign policy adviser to the campaign. He has since acknowledged that is untrue.